Hypothetic mechanism of ME/CFS linked to amino acid catabolism. According to this model, ME/CFS is caused by immune interference with an unidentified target, potentially a signaling factor, which ultimately causes metabolic dysfunction and induction of secondary rescue mechanisms. 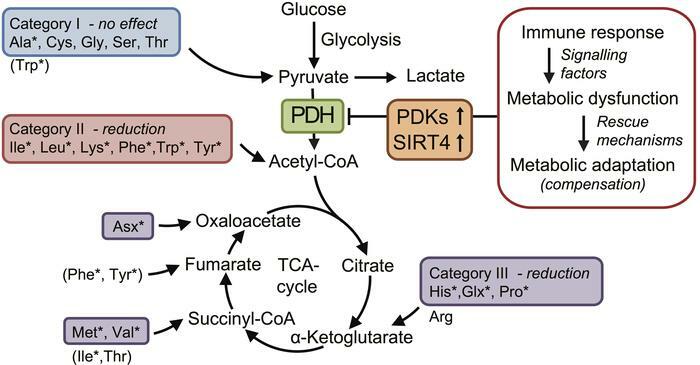 We hypothesize that aberrant PDK and SIRT4-mediated inhibition of PDH, and consequent obstruction(s) in central energy metabolism, occurs early during ME/CFS pathogenesis, followed by metabolic adaptations serving to maintain ATP production. The result will be increased consumption of amino acids not depending on PDH to fuel oxidative metabolism via the TCA cycle. Such a mechanism would expectedly change the serum amino acid profile in patients, depending on the different entry stages of the amino acids into the catabolic pathway. Accordingly, for the purpose of serum amino acid profiling, the 20 standard amino acids were assigned into three categories: category I amino acids that may convert to pyruvate (i.e., dependent on PDH; Gly, Ser, Thr, Cys, Ala); category II amino acids that may metabolize to acetyl-CoA and fuel the TCA cycle (i.e., independent of PDH; Lys, Leu, Ile, Phe, Tyr, Trp); and category III amino acids that are anaplerotic and serve to replenish TCA cycle intermediates (i.e., independent of PDH; His, Pro, Met, Val, Glu + Gln = Glx, Asp + Asn = Asx). The asterisk indicates amino acids that were significantly reduced in serum of ME/CFS patients compared with healthy controls in this study (see Table 1 and 2).